Create a Better Home Care Routine with Grove Collaborative January is a great time to start practicing a better home care routine. But what does 'better' look like? For me, it's about finding simple, healthy solutions I can stick with all year — even when things get chaotic. Enter Grove Collaborative! Grove simplifies tasks like shopping for home and personal care products. Instead of making an extra stop at the store, you can come home to all your favorite healthy, affordable products sitting on your doorstep. Switching to beautiful home care products has been a real game-changer for me. Because I look forward to getting out this stylish cleaning caddy, I'm much more inclined to stick to my cleaning routine. And dishes don't feel like such a chore with a stylish sponge and lovely smelling dish soap. 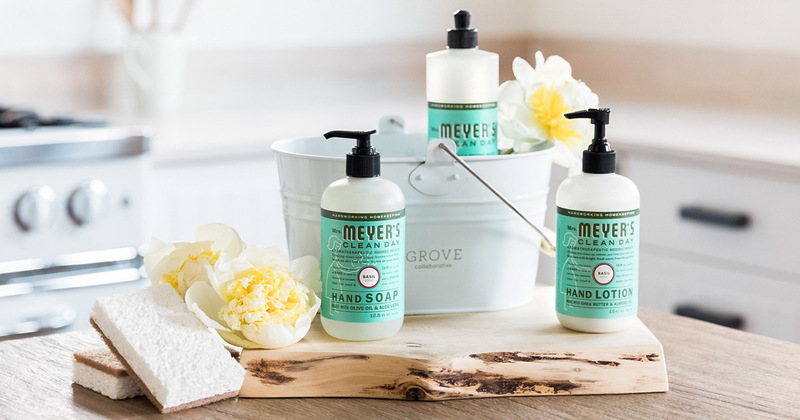 I can’t say enough good things about Mrs. Meyer’s soaps and lotions. They were some of the first natural products I started using, and they’re still a staple in my kitchen and bathrooms. All the products are non-toxic and made with plant-derived ingredients so I can feel good using them around my family. Right now I’m using the basil scent because it really perks me up on grey days! When I first started developing a natural cleaning routine, I spent a lot of time (and money) experimenting with making my own cleaning products. It turns out that spending hours mixing glass cleaner isn’t necessarily sustainable for me when things get busy. Healthy living is all about balance, and for me that means buying mostly ready-made products from companies I trust. With Grove Collaborative, I don’t have to stand in the grocery store aisle Googling hard-to-spell ingredients before I add an item to my cart. They’ve done their homework, which makes it easy to know which products are better for my family. Grove Collaborative wool dryer balls — these are genius! Smarty Pants adult probiotic complete — to keep yourself healthy, too! You will receive the New Year, New You Offer for free when you sign up! To receive this offer, your order needs to be a minimum of $20. Choose the combination of products and scents you love and receive your first box within a few days. You made it!